You must make reservations at least 5 minutes in advance of the time at Patagon. We'll be offering specials like Spring Quiche, Crab Cake Benedict, Steak and Eggs, and more! Elegant with nice booths. Portions are uneven - only 2.5 scalllops (!?) in one entree, large salmon portion in another. Grilled lamb delicious though 2/3 was fat To be trimmed away. Initially server was slow to arrive, but thereafter was very attentive. Had a wonderful pre theatre dinner. Food and presentation wonderful. Excellent wine selection. Appetizer and dessert were amazing, but the main courses were a bit of a letdown. Staff was very friendly and attentive. Our experience at this restaurant was mostly positive. Service was outstanding, ambiance was beautiful, but our food didn't have that wow factor. Granted, I did order seafood at what seemed to be a steak restaurant and my husband chicken was good, not impressive, though. My mussels, shrimp, and crab pasta dish didn't have much of a personality, and for the prices, I honestly expect all of the menu items to impress. The most impressive dish was the ceasar salad...it was delicioius. Great food in a warm, modern ambiance. We ordered the bin-in pork chop with some hesitation. Restaurant pork chops are often over cooked and dry. Patagon’s was flavorful and juicy. Definitely the best restaurant pork chop we have ever had. Waiter might have been new. Had to look at her sheet to answer questions about ingredients. Came twice to ask us if we were ready to order when we were clearly still deliberating, I was leaned over looking at my friend’s menu together. later than the others. She didn’t mention when she dropped off the first ones that the fish was coming and wished us a good meal and told us to tell us if we needed anything else. So, we were worried she left off and didn’t put an order in. It took a while to get her attention to ask if it was still coming. The food looked delicious (and tasted amazing) so we wanted to take a picture. We were struggling to take the selfie and wanted to ask her to help take a picture for us. While standing next to us and walking past us as we were struggling to take a picture a 5 stair waiter would have offer to take it. She doesn’t get even 4 stars because once we finally got her attention and ask if she could take a photo for us, she said, “just in a bit” and left. What... were we supposed to keep sitting there not eating all the food and wait for her to come back? We waited for a little and gave up. Even when she did come back (to address the only other full table in the large restaurant), she did not talk to us or say she was ready to take a picture. In fact she didn’t stop by to do anything after. She just gave us a check without even asking if we wanted dessert. We decided not to get dessert because of her. The food was stellar but she really ruined our mood. Maybe it’s because gratuity was included so she did not have to pay attention or maybe she was new to the industry. The beet salad was amazing, the service was friendly and professional. This is a “must go again” place! I thought it was good, not great. Chewy,tough empanada dough, good sirloin, alfajores we’re dipped in Chocolate, dulce de leche. Good service. Service was very slow. Empanada was served cold. Warmed up one was presented but too hard to eat. Beet salad was wonderful. Steak served too rare. Salmon burned accompanied by charred asparagus. At this point we left the restaurant. We were seated in front of the open kitchen. Two employees visible and terribly overwhlemed. Captain then stood by the kitchen tapping his foot and schuffling all of the waiting orders. Not conducive to an enjoyable, relaxing meal even with exceptional food. Lovely spot. We had breakfast, happy hour and dinner here. All we’re exemplary! Very friendly staff and the food was excellent! Outstanding food and beverages. The menu is a delight for both meat eaters and vegetarians. Second visit in less than 4 days. Patagon is a keeper, can’t wait to return! The food was incredible but the service was a little stand offish and slow. Was a bit surprised that there was a service charge included on bill for only 3 people. Is this the new normal? 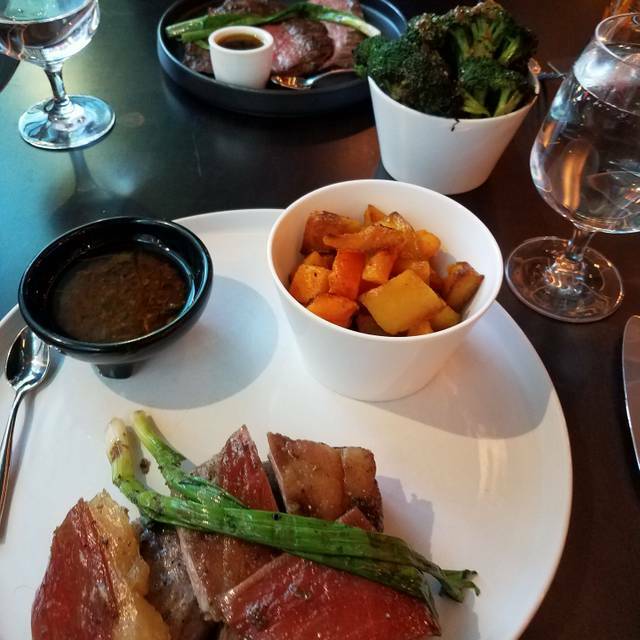 During my last visit to Seattle I enjoyed Patagon so much that it was a must do on this trip back and was just as outstanding this time around. The steak and sides are prepared to perfection and full of flavor. Go as a group so you can try several of the sides. They are all amazing! One of my favorite new restaurants in Seattle. Love the wood fire cooking. They really know what they are doing and service is excellent. Already becoming a regular since it is so good. The New York Strip and Halibut special were some of the best we have ever had. Meat. Lots of Meat. And it was good meat with an Argentinian flavor. The side dishes were delicious and the drinks were good. I was surprised that the bar couldn’t offer suggestions on common drinks but what we had were decent. 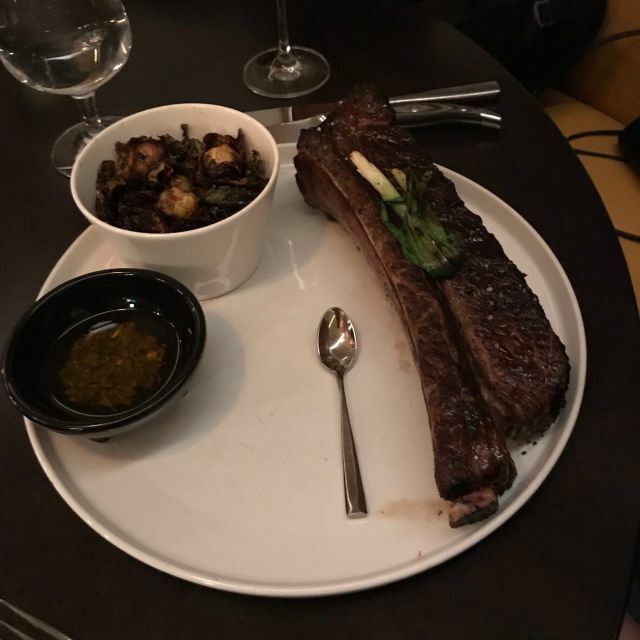 If you order the short rib, be prepared. There is nothing short about it and it tastes more like the ribeye close to the bone. Very nice experience! Food was great: it was nice to try something new. Started with the empanada. Delicious. Loved the chili lime sauce with it. Tierra del Fuego (scotch) and Mouth of Florian (bourbon) drinks were so complex and good. Next had the beet salad. Garnished with sliced fennel and pine nuts with a carmelized topping on a blood orange. Such an interesting combo.We had the lamb and the flank steak for the main. Each came with a side large enough to share. We had smokey broccoli and butternut squash. Finished with coffee and churros. The chocolate / carmel sauce was infused with orange and just a bit of heat. The price included the well deserved 20% tip. Fabulous service. We will come again. Limited menu options, small portions. Server friendly, but new to the job and not overly knowledgeable on the menu. Main course was delicious. Appetizer was ok- a little over cooked. Music would get loud- not sure why they thought it need to be. Did ask them to turn it down once. Being from Argentina I always get SO excited when a new Argentinian restaurant opens in town and I am always disappointed. Patagon is no exception. I understand this is "Argentinian inspired" but so many things were amiss I cannot give a better review. I was there for Valentine's Day. For starters I had the duck empanadas and my husband had the scallops. The empanada filling was delicious if a little dry but the dough was Horrible, It was so hard and overcooked I couldn't even eat it. The scallops were seriously undercooked and had a coating of hot spices that overpowered the delicacy of the scallop. Argentinian food is not spicy hot! The polenta that came with the scallops taste more like grits than polenta, it was pretty flavorless. For the main dish I had the lamb and my husband had the porcheta. The lamb was delicious and tender except for, again, a very spicy green sauce on top. The creamy Brussel sprouts were SO good I just wanted a huge bowl of it. The porcheta was dry and flavorless and the potatoes that came with it were overcooked. Portion were very generous, service was horrendous. They seem very disorganized and dishes took forever to arrived. If this is the cooking time on a night with a fixed menu, I cannot imagined what it would be in a night with a full menu! It wasn't because they didn't have enough people, there were at least 5 people in the cooking area and plenty of waiters. They had two hosts that just walked around doing nothing. We ordered a coke in the middle of the main dish and it took at least 20 minutes to arrive, after I reminded the waiter about it. Dessert was meh. I will give it a try again only because I am intrigued to see how they pull off a couple of true Argentinian dishes like the alfajores, choripan (the only Argentinian dish in the breakfast menu). By the way chapa has only one p, chivito is goat, not skirt steak, and fugazza is not a sandwich but a type of pizza (onions and cheese with faina), just saying. Other issues. The SA did a better job than everybody else. Congratulations to her! First visit. 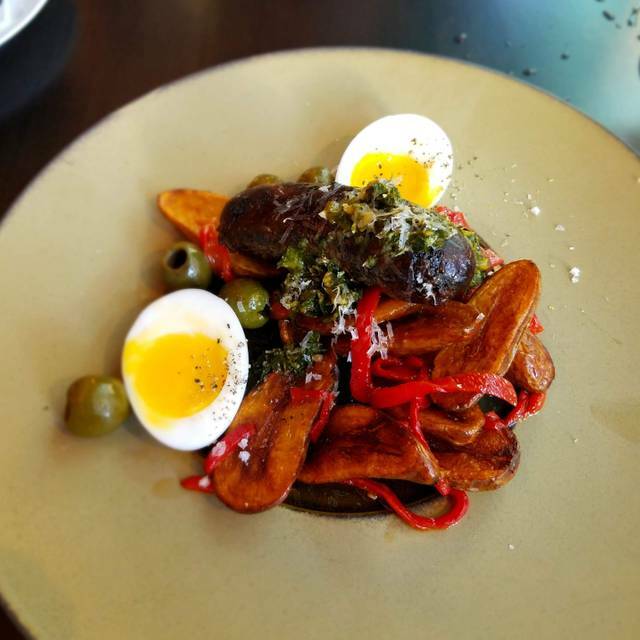 Love this meat-centric Argentine-inspired restaurant. Food is amazing and the service was attentive. We brought several bottles of higher end Bordeaux and the wait staff was helpful with decanters, glassware, etc. The only downside is that you will go home smelling like you stood next to a campfire. 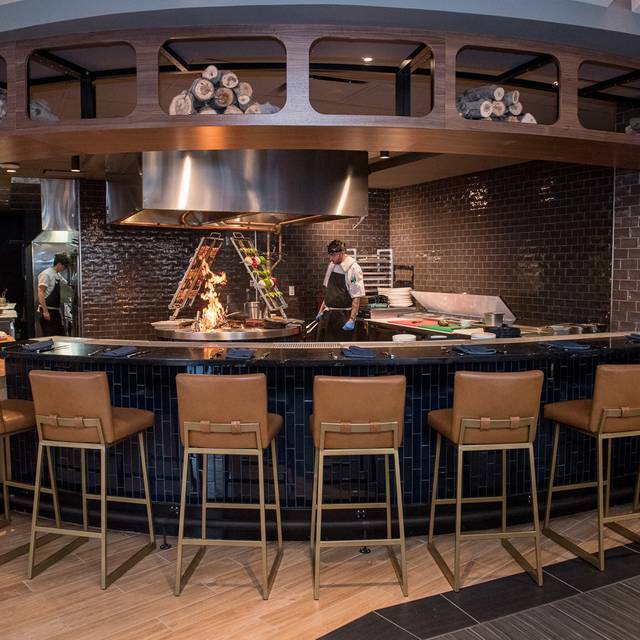 The smoke from the open wood fired pit permeates the restaurant. 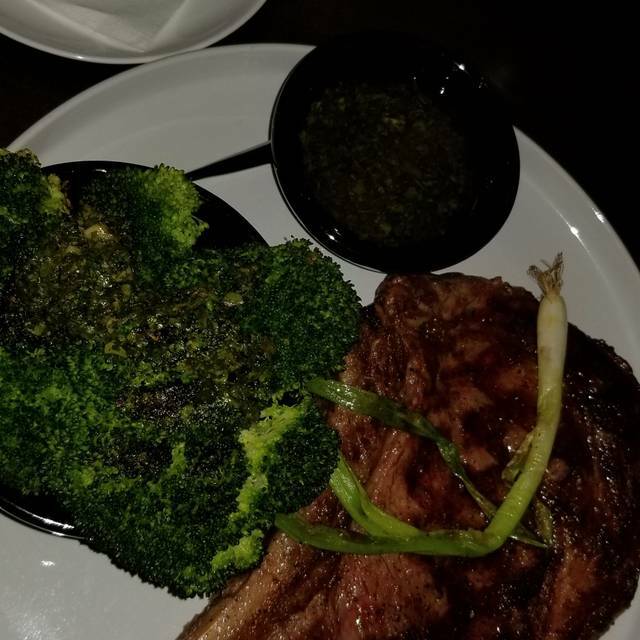 We ordered a Gaucho Ribeye and it was AMAZING and perfectly cooked. WAY better than the wood-fired open pit grilled steak at Assend in Bellevue. Am planning a return visit. Excellent! Particularly loved the pumpkin empanadas and the sweetbreads. My new fav in Seattle! Loved all the food and wine. 4 of us shared some salads, sides, and yes we went for the 3lb steak. Yum yum yum! Would be 5 stars except that it took too long to get our first order of drinks (our server could have come around more often) and small portions of side dishes. The food was excellent. Our table of 4 shared several small dishes and salads, plus the bone-in, 3lb, aged Rib Eye that was on special. Perfectly cooked and just the right amount of seasoning. Suggestions: We thought the sides were on the small side and could have been bigger: example, the mushroom side came in a 4 oz cup...not really more than a taste, particularly with the entree; offer 2 sides with an entree instead of one - given their smaller size. The strip steak was fabulous. Cooked perfectly- requested medium rare. the chimichurri was delicious as well. Ambience was very nice for datenight. Good wine selection. The pappardelle was sublime—we will be back on the strength of that alone. It was quite cold outside and I was freezing when we walked in; our server took note and immediately asked me if I wanted some hot water to warm up—so thoughtful, so appreciated. 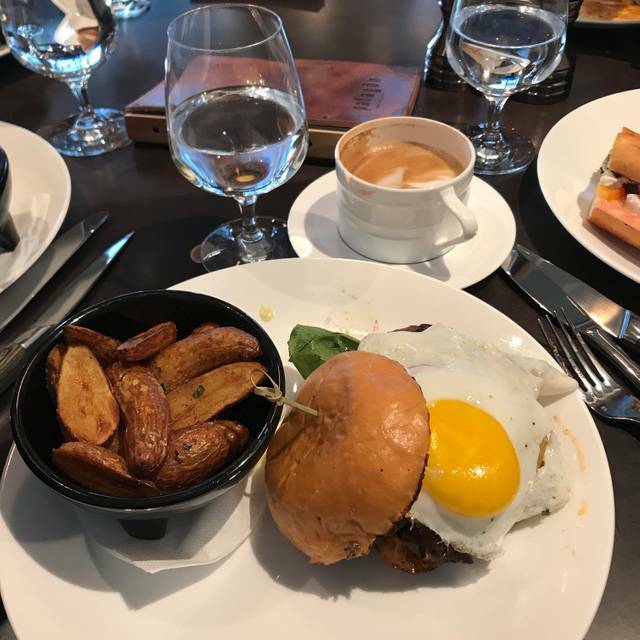 The menu does have its expensive moments (an 80 steak) and it’s a hotel restaurant, so the ambience isn’t the best, but there are great finds on the menu and the decor is very good for the varied clientele it needs to serve. All in all, the location in the new Charter Hotel, the food and the service were so good, they outweigh any small nits I have with decor. Do go! The best steaks in town. Everything on the menu is delicious and the staff is super friendly and attentive. Patagon is quickly becoming our favorite spot in town. We made a brunch reservation for nine people. It took close to 30 minutes for them to set the table and to get seated even though the restaurant was empty. The waitresses were confused and didn't really acknowledge us while we waited. This poor service continued after we sat. The servers took a long time to get our drink and food orders and we had to call them over constantly for water/coffee refills. The food was good, but came cold (I presume this was due to the servers being slow) and one of us got a whole egg shell in her dish. Poor experience overall! Service was first rate! The management and staff were professional in appearance, had positive attitudes, and were all very attentive. (Didn't expect this level of service because it was Christmas night and I'm sure many of them would have preferred to be at home.) The food was delicious, of course, but you can find good food anywhere. Excellent service is harder to come by. I would highly recommend Patagon for a nice evening out in the downtown area. Food was good, waiter was perfect! Recommended wine for our meals and in general checked in to make sure all was good. The staff is attentive and helpful and the food is amazing. Service and ambience was excellent. Food was fine, but needed to be served much warmer than it was. 1st course should have been served at same time to each of us.